We all know very well that the well-known Battle Royale game, of course, I am talking about the PUBG Mobile is a mass sensation and such is the level of addiction of thousands of players that now it is testing restrictions of hours of daily play in some countries. As when you pass a limit of daily hours of play in the game, it will simply close, and you have to wait for the next day. The well-known Battle Royale game, of course, I am talking about the PUBG Mobile is a mass sensation and such is the level of addiction of thousands of players that now it is testing restrictions of hours of daily play in some countries. As when you pass a limit of daily hours of play in the game, it will simply close, and you have to wait for the next day. A limitation that is proffered by the high level of addiction of some players who spend the day stuck to the screen of their mobile devices. And not only that even this high addiction is also happening in Fortnite as well, so it would not be strange at all that they would also take this decision shortly in another mass sensation. As the well-known Battle Royale game PUBG Mobile, about which we have counted for days the celebration of its first anniversary with rewards, a new update and the new season, is testing restrictions of hours of daily play in some countries as we told earlier. While we already knew that in India many players have been arrested for playing this game in this country that has launched prohibitions to enjoy this game. Hence, the Tencent Games has named these tests as “health control” and the goal is that in those countries it can be played again without any kind of prohibitions. 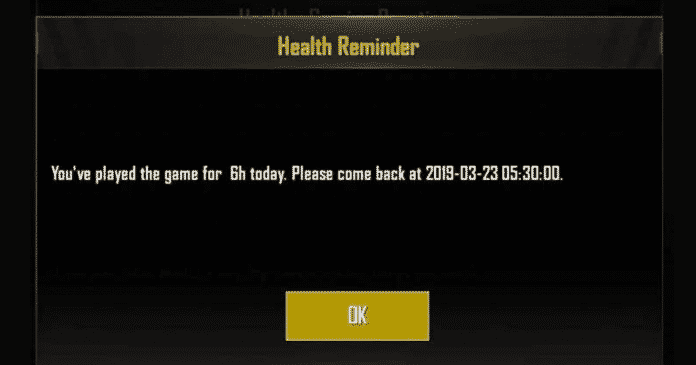 As the health control means that when PUBG Mobile detects that you have spent more than 6 hours of time playing the game, a warning message is sent reminding that the time limit has been exceeded and, therefore, the servers can no longer be accessed until the end of the day (5:30 am in the morning of the next day). Basically, it is an aggressive measure, but let’s be honest, as we are talking about games that are played by millions of people of all ages in which there is no control whatsoever. So it was a matter of time before controls on the well-known Battle Royale game like PUBG Mobile and Fortnite began. So, what do you think about this? Simply share all your views and thoughts in the comment section below.